SIMCOM has partnered with Southern AeroMedical Institute to make the world’s most advanced hypoxia training program available to our customers. 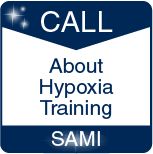 DeSat is individualized slow onset hypoxia training. Schedule your DeSat training in conjunction with your aircraft training program while at SIMCOM. This training is relative to every division of general and commercial aviation. Contact one of our Training Advisors for details.